Mercer Health’s Outpatient Center offers a wide number of services that many think can only be found in the big city. 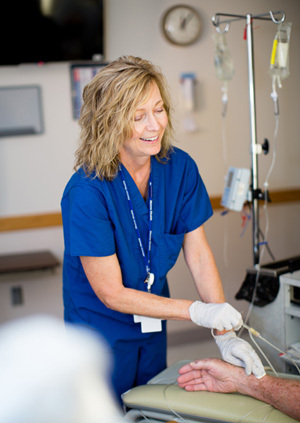 Our Center, conveniently located on the first floor of the Sanderell Family West Wing at Mercer County Community Hospital, provides such services as outpatient IV infusions, injections, and many other specialty services. If you need a blood transfusion, antibiotic infusion, allergy injection, chemotherapy, coagulation management, central/peripheral line care, or any other type of outpatient treatment, our Outpatient Center may be able to save you gas money by having it done right here in your own back yard. We provide these services in private treatment rooms with your comfort in mind. The Outpatient Center is open Monday through Friday, appointments are required. Appointments are set up through your attending physician. If you have any questions about a treatment you think you could receive at our Outpatient Center, please call 419-678-5681. The services we offer are listed below.